c1757-1833. He was the son of John and Elizabeth Bradley, and the great-nephew of the astronomer royal, James Bradley. Bradley entered the navy in 1772 and was commissioned lieutenant on 25 October 1778. 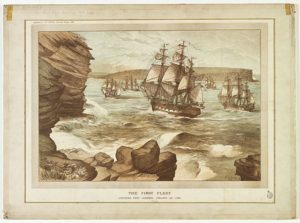 Prior to joining the Ariadne 20, which was commanded by Captain Arthur Phillip from 1781-3, he saw service in the Lenox 74, the Aldborough 24 and Mermaid 28, both of which were commanded by Captain James Hawker, the Rippon 60, Prothee 64, and Phaeton 38. In 1786 he was appointed first lieutenant of the ex-Indiaman Sirius 24, Captain John Hunter, flying Commodore Phillip’s broad pennant in the voyage of the First Fleet to New South Wales. Remaining in the new colony, Bradley initially made himself an expert on the ways of the aborigines, taking the time to study their lifestyle and opening communications with them, although with familiarity his favourable opinion of them altered. He also spent a great deal of time with Hunter surveying the coast, and from October 1788 until March 1789 he was absent from Australia with the Sirius collecting supplies from the Cape. In 1790 he joined a party that was sent to colonise Norfolk Island, and although the Sirius was wrecked and he was stranded with the crew for eleven months he used the time wisely by undertaking further surveys. He eventually returned to England via the Philippines on 23 April 1792 and was promoted commander on 28 April on the recommendation of Commodore Phillip. Having been appointed to the fireship Comet 14, Bradley served in the Channel from July 1793 and commanded her at the Battle of the Glorious First of June in 1794, where she was employed by the commander-in-chief, Admiral Lord Howe, to repeat signals. As a reward for his involvement he was posted captain on 23 June 1794, but lacking interest he then had to endure a long eight years of unemployment. His next ship proved to be the Ajax 74, which he commanded on a temporary basis from 28 February to 19 April 1802 before paying her off at Chatham. He then immediately recommissioned the frigate Cambrian 40, in which he took Vice-Admiral Sir Andrew Mitchell, the new commander-in-chief of North American waters, out to Halifax, Nova Scotia. Once hostilities recommenced in 1803 the Cambrian captured two French privateers on the way to Bermuda, as well as several other vessels thereafter, but Bradley also fell afoul of the American authorities when pressing some seamen out of the British ship Pitt at New York, in which port the Cambrian had been blockading two French frigates. As a result of the diplomatic fallout that followed this alleged breach of neutrality he was superseded by Captain John Poo Beresford towards the end of 1804 and recalled to answer the American complaints, returning home as a passenger aboard the Révolutionnaire 44, Captain Hon. Henry Hotham. Clearly the Admiralty were satisfied with Bradley’s conduct, for in the early spring of 1805 he was appointed to the Plantagenet 74, serving at the Nore, off Ushant, and in the blockade of Brest before joining Rear-Admiral Sir William Sidney Smith’s squadron when it went out to the Tagus to evacuate the Portuguese Royal family in November 1807. He was later present when the Navy re-embarked the remnants of the Army following its defeat at the Battle of Corunna on 16 January 1809. Sadly in 1809 a mental illness became increasingly apparent, and Bradley was obliged to resign his command of the Plantagenet to his first lieutenant. Having then joined the less exacting Impress Service at Cowes he suffered a further breakdown in 1812 and retired from duty. Bradley was promoted rear-admiral in line with seniority on 12 June 1812, but after becoming increasingly deranged he was sentenced to death on 29 July 1814 for defrauding the Post Office of a minimal sum, although on representations from his family the sentence was commuted to that of transportation, and then to exile. At the same time he lost his rank and pension. Having found refuge at Le Havre in France, Bradley devoted his retirement and exile to the development of a device for determining longitude, not least because he hoped that a useful invention would earn his redemption with the British authorities. Despairing eventually of success, although he was pardoned in 1822 he became a recluse and died at Le Havre on 13 March 1833. Bradley married Sarah Witchell on 24 February 1787 at Havant in Hampshire and had three daughters and a son. Although described by his family as kind-hearted, his contemporaries found him aloof and rather difficult to deal with. In addition to excellent cartographic and observational skills he was a keen diarist, a natural historian, and a skilled artist. Bradley’s Head on the north shore of Sydney Harbour was named in his honour.